AltiSpace makes for a superb add-on to any mobile DAW at a very fair price indeed. Sounds are excellent. Inter-App and Audiobus support. Import your own impulse responses. Great value. Not much at this price. 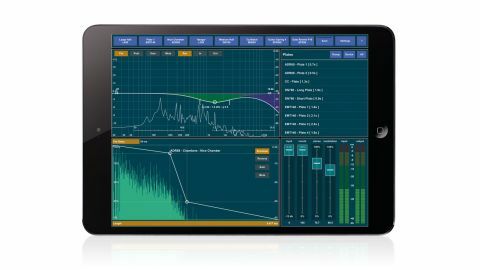 A convolution reverb for iPhone, iPad and iPod touch (the first of its kind, as far as we're aware), iMusicAlbum's AltiSpace boasts a sizeable library of over 200 impulse responses captured from high-end and classic gear. "Key units include the Eventide H3000, Lexicon 300, 480L and PCM-60"
Key units include the Eventide H3000, Lexicon 300, 480L and PCM-60, AMS RMX-16, TC Electronic M5000, and EMT 140, plus you have the ability to import your own. Shaping of the impulse response is done in the four-stage volume envelope panel, which also hosts a pre-delay slider (up to 147ms) and a Reverse button for running the reverb backwards. Above that, a three-band EQ (LF filter, HF filter and parametric band) can be applied to the input or output, with a background spectrum analyser visualising the results. Thanks to its stellar sound and support for both Audiobus and Inter-App Audio, AltiSpace makes for a superb add-on to any mobile DAW at a very fair price indeed. Of course, we'd like to see some environmental IRs added, but we gather that's on the cards for a future update.